8:39am: Good morning Nigerians. 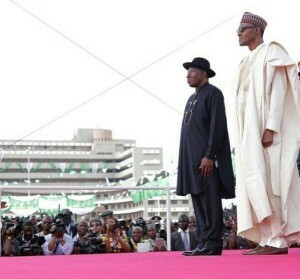 It is the D-Day, and the whole country is eagerly waiting for the President Goodluck Ebele Jonathan to officially handover to the Muhammadu Buhari, who of course is a former military ruler of Nigeria. The Guardian is on ground to bring to you live proceedings from the Eagle Square, Abuja, where the presidential inauguration is taking place. Please, stay with us. Good morning once again. 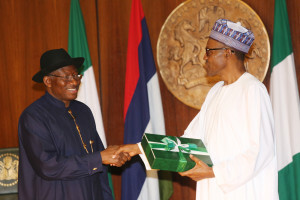 8:46am: Lets not forget that yesterday, President Jonathan submitted the handover notes to the incoming president, Muhammadu Buhari. Here is a picture from the event. 8:52am: We can confirm to you that some leaders of the soon-to-be the ruling party in Nigeria, the All Progressives Congress, APC, are already at the Eagle Square. 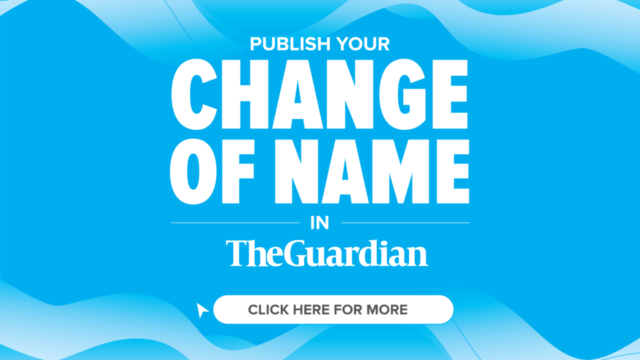 These include the national leader of the party and former governor of Lagos State, Senator Bola Ahmed Tinubu, former vice president of Nigeria and a presidential aspirant on the platform of the party, Atiku Abubakar and former governor of Anambra State, Chris Ngige. 8:57am: Over 50 leaders from all over the world are expected to witness the inauguration of Muhammadu Buhari as the 14th President of Nigeria. 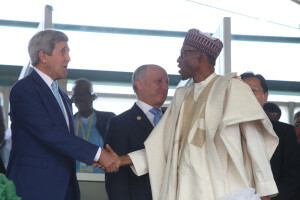 The US government’s delegation is led by the US Secretary of State John Kerry. 9:00am: Former President of Nigeria, Alhaji Shehu Shagari has arrived Eagle Square. So also is the former head of state, Abdulsalami Abubakar, who is incidentally, handed over to President Olusegun Obasanjo in 1999. 9:09am: Former President Olusegun Obasanjo just walked into Eagle Square. Dressed in white agbada and a red cap, the man popularly referred to as Ebora Owu was a staunch critic of President Goodluck Jonathan. 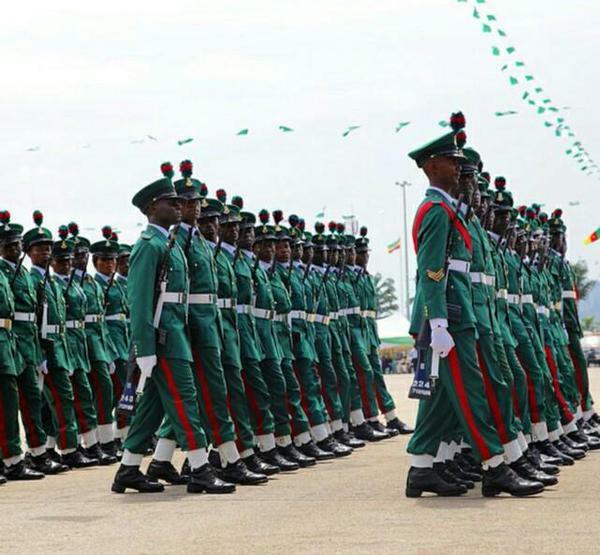 9:13am: The service chiefs and the inspector-general of police have arrived at the Eagle Square and were treated to a general salute by the men and officers of the Nigerian military dressed in their ceremonial outfits. 9:16am: Here are more pictures from yesterday when President Jonathan took Muhammadu Buhari on a tour of the presidential villa. 9:22am: While we wait for more officials to arrive, P-Square are on stage to entertain the crowd. 9:32am: Here comes the US Secretary of State, John Kerry. He waves to the crowd as photojournalists mill around him. 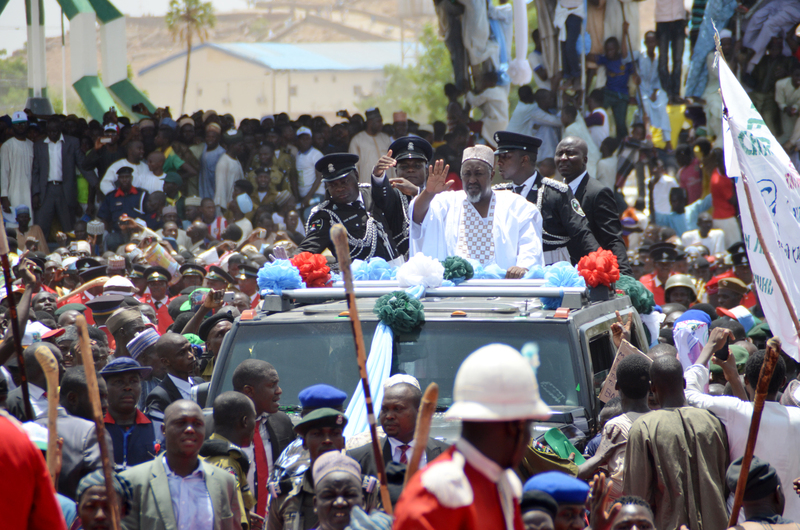 09:42: Vice president Namadi Sambo is now at the Eagle Square. He was treated to a national salute by the men and officers of the Nigerian Military. 09:53am: K-1 the Ultimate is on stage to thrill the guests. Of course, the fuji musician has been the unofficial musician for the All Progressives Congress, especially in the southwest.”Sai Baba, Sai Buhari,” he croons. 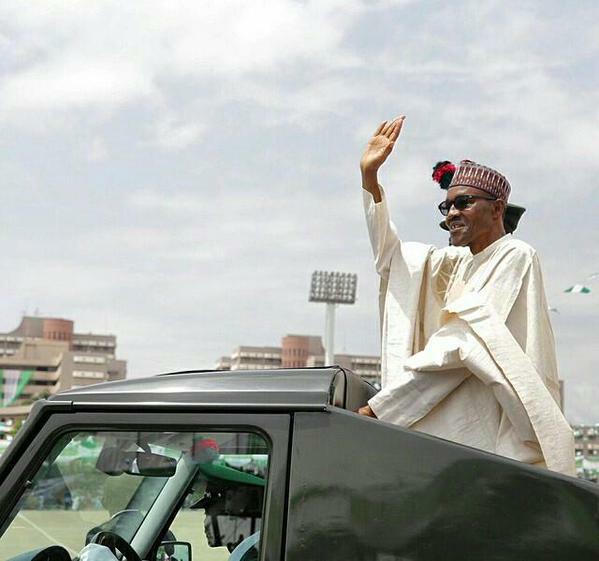 09:58am: Here comes the man of the moment, Muhammadu Buhari. He arrives in a convoy. 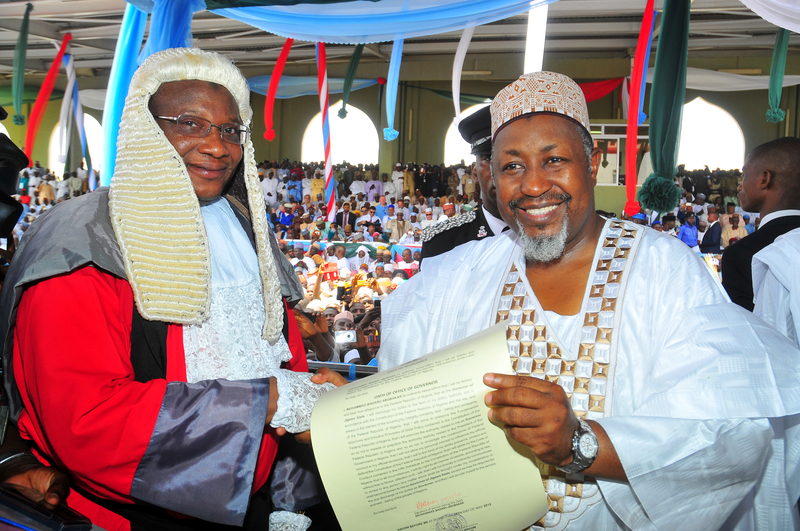 He is dressed in a white agbada with a multi-coloured cap on his head. Prof Osinbajo is also around now. He is dressed in white agbada too. but with a his trademark cap. 10:02am: While K-1 the Ultimate regales the crowd with his beautiful music, Buhari is busy greeting former heads of state and past presidents of Nigeria, as well as the world leaders that are already seated. 10:06am. 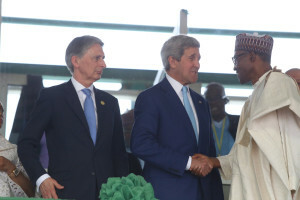 Buhari shakes John Kerry, discusses briefly with with him before moves on to the likes of Atiku Abubakar, Tony Elumelu, TY Danjuma, Asiwaju Ahmed Tinubu, Chief Bisi Akande, Aliko Dangote, Femi Otedola etc. 10:12am: Today’s inauguration is historical. 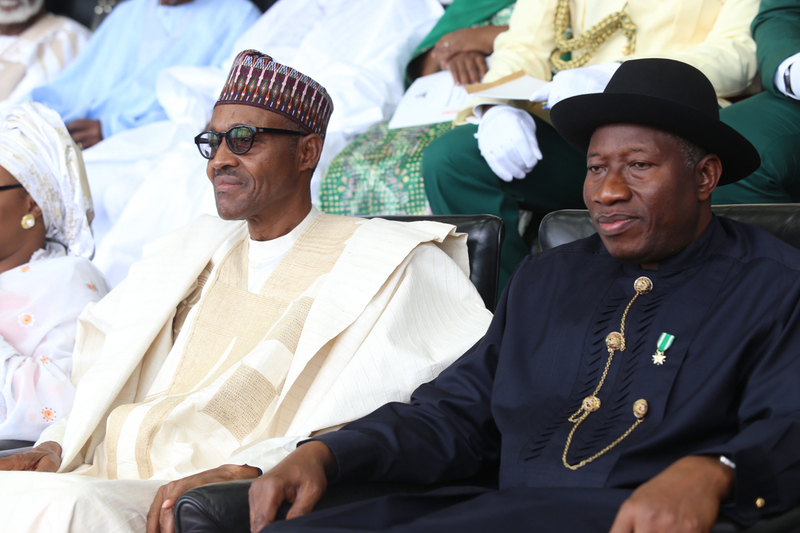 This is the first time a Nigerian president will be handing over to an opposition. 10:16am: The president’s car moves straight to the front of the dignitary stand. Six men of the SSS surrounded the car. 10:18am: He steps out of the car and moves to stage to acknowledge the national salute rendered by the men of the Nigerian military. 10:19am: Everyone is standing as the military band renders the Nigerian National Anthem. 10:20am: The commander of the presidential parade, Lt. Col. Oseni Omo-Braimah seeks and gets the presidential permission to carry on with the parade. 10:23am: The opening prayer is in progress. It is led by a representative of the CAN president, Ayo Oritsejafor. The representative is Rev. Israel Akanji, the chairman of CAN, Abuja. 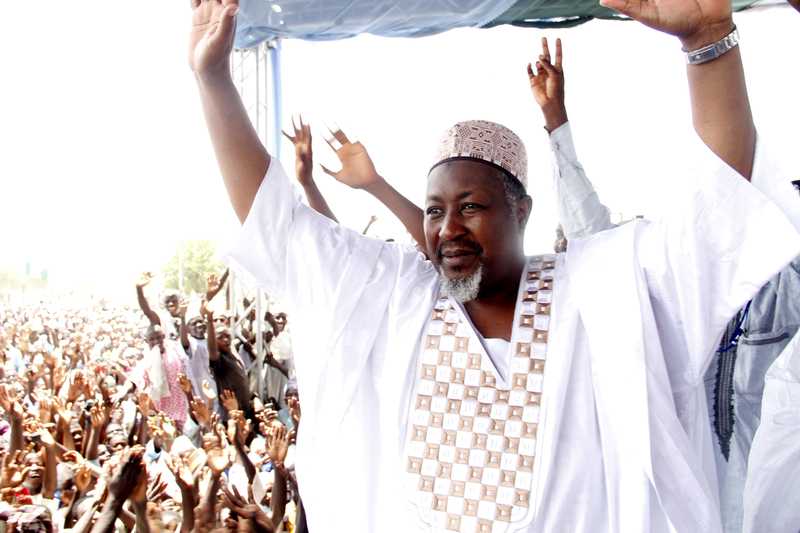 10:30am: The Muslim prayer has been said by the deputy imam of the Abuja National Mosque, Dr. Ibrahim Mahmud. 10:31am: The Chief Justice of Nigeria, Mahmoud Muhammed and the Chief Registrar of the Supreme are introduced by the compere. These two men will conduct the official inauguration. 10:32am: The chief Registrar has just invited the Chief Justice of Nigeria, Mahmoud Muhammed, GCON, to come and administer the oath of allegiance of Muhammadu Buhari and Yemi Osinbajo. 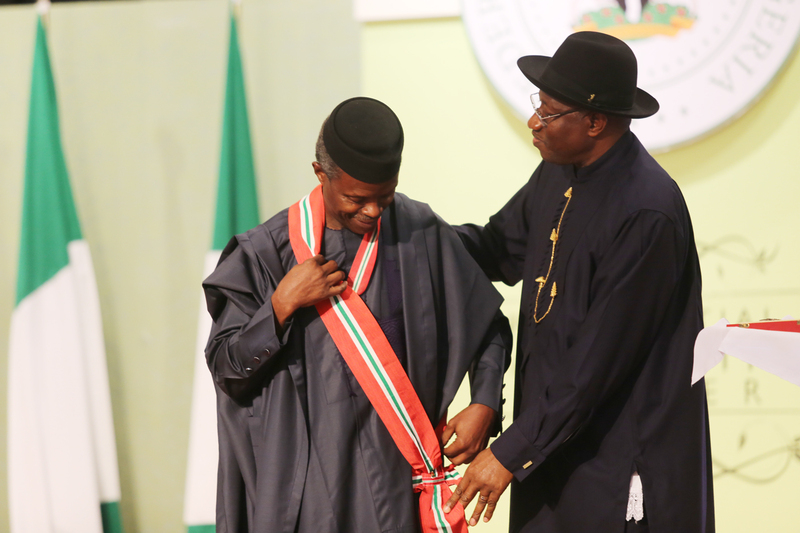 10:33am: Professor Osinbanjo will be the first to be sworn-in by the CJN, who is already seated at the podium. 10:34am: PYO walks to the podium. The oath of allegiance has been administered on him. So also is the oath of office. His wife, dressed in white lace, stands beside in him. 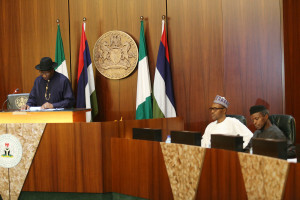 10:43am: The Chief Registrar of the Supreme Court has invited President Jonathan to the podium. 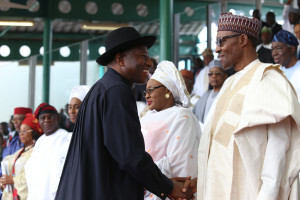 Jonathan is performing what will be his last duty as the president of Nigeria – he is going round to shake the hands of all the world leaders seated. He is now at the podium. 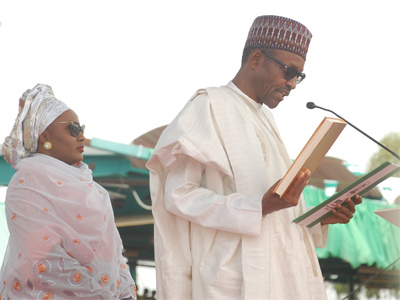 10:45am: Muhammadu Buhari has been invited to podium for his swear-in. Eagle Square is greeted to a loud ovation as he walks to the podium accompanied by his wife, Aisha. 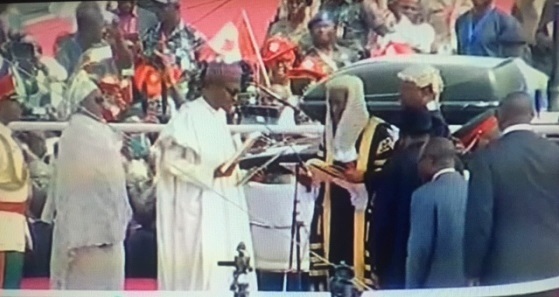 10:46am: The oath of office and oath of allegiance are being administered on him. 10:49am: IT IS OFFICIAL. 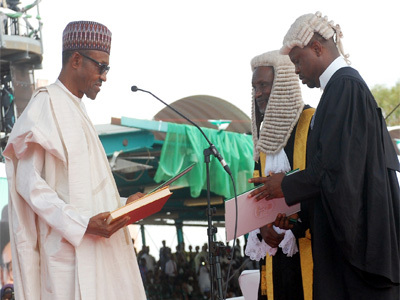 MUHAMMADU BUHARI IS NOW THE PRESIDENT OF NIGERIA. 10:50: President Muhammadu Buhari is now signing all necessary documents in front of the CJN. And K-1 the Ultimate of KWAM 1 if you like, is back on the bandstand. Former President Jonathan stands beside President Buhari. 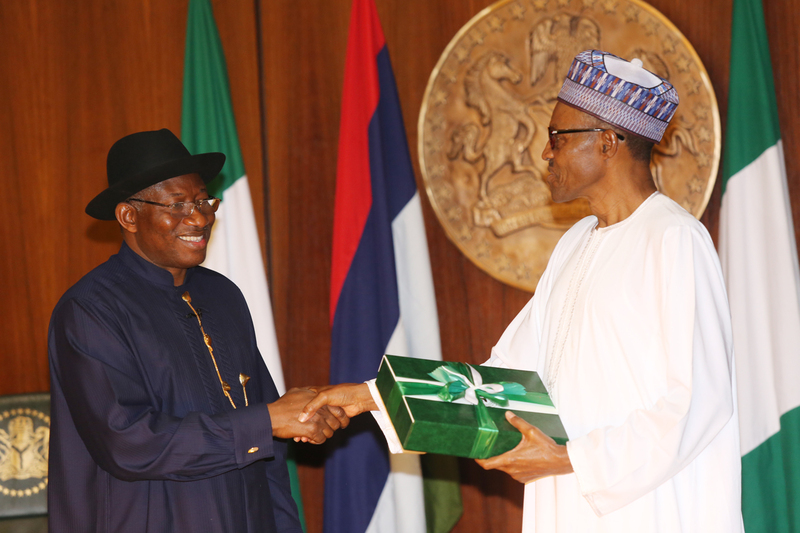 He hands over the instrument of office to President Buhari. 10:59am: Nigerian flag and the defence flag have been lowered and packed. They are handed over to the RSM of the ELite Guards. The RSM matches over to his superior, who in turn gives it to the Chief of Defence Staff, AVM Alex Badeh. AVM Badeh walks up to former President Jonathan and hands over the flags to him. AVM Badeh now gives new flags to Commander Omozojie, who matches up to the RSM with the flags. The RSM then hands over the flags to two officers who will hoist the new flags to symbolise the beginning of a new regime. Right now, everyone at the Eagle square is standing. 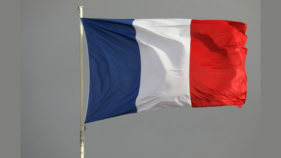 This is what you call RESPECT TO THE FLAG. President Muhammadu Buhari is proceeding to release the pigeons and balloons into the air. 11:13am: President Buhari is set to inspect the Guards of Honour. 11:20am: President Buhari moves back to the podium after inspection of parade. 11:22am. Match past by the Nigerian military is up next. SLOW AND QUICK TIME. President Muhammadu Buhari has his work cut out for him. His campaign rode on the back of CHANGE. A lot of Nigerians desire changes in every facet of the national life. And change Nigerians will expecting from him, especially in the areas of the security, economy, corruption and power. Analysts believe that if these four areas can be fixed by this government, Nigeria and Nigerians will be the better for it. What do you think? 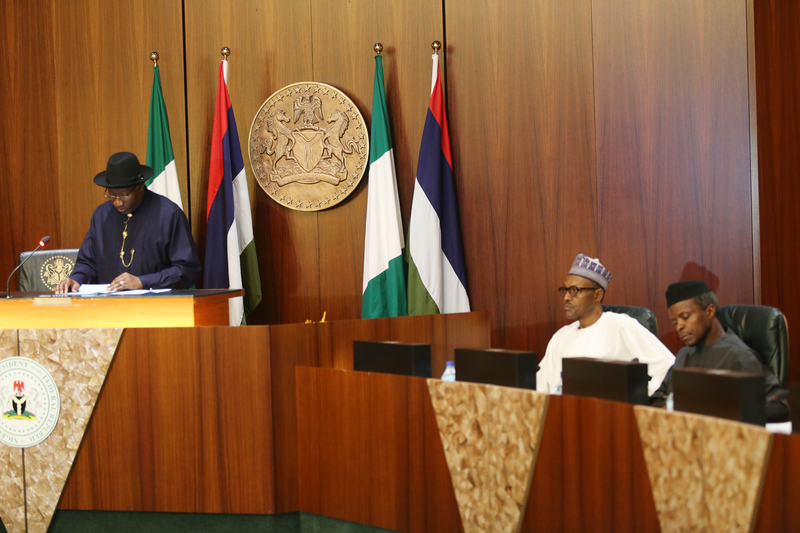 11:51am: President Buhari is at the podium for his first speech to the country as the president of Nigeria. He acknowledges the contribution of Nigerians, friends of Nigeria within and outside the country and former President Jonathan for his “statemanship”. 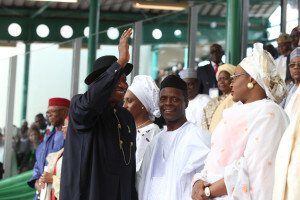 He also acknowledges those who did not vote for him for contribute to the culture of democracy in Nigeria. “I am for everybody and I am for nobody,” he says. He thanks Cameroon, Chad and Niger for their fight against Boko Haram. He says his government will be dedicated to fighting terrorism, climate change, power supply inadequacies, spread of communicable diseases etc. 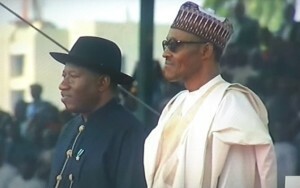 He says Nigerians should not submit to the spirit of defeatism. “We can fix our problems,” says Buhari. He vows to respect the Rule of Law, to make the public service efficient and effective. He says he will interfere in the duties of the Legislature and the Judiciary. 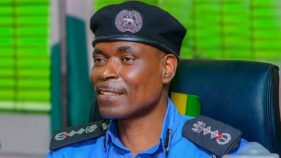 While the Federal Government will not meddle in the activities of state and local governments in the country, he will not close his eyes to abuse of power and office, he says. 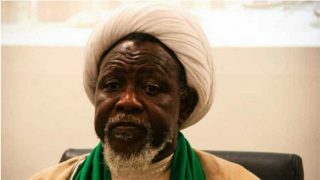 He appeals to the media to be patriotic and responsible. President Buhari recognises the contributions of the founding fathers of Nigeria: Nnamdi Azikiwe, Sir Ahmadu Bello, S. L. Akintola, Obafemi Awolowo etc. He also acknowledges the legacies of the Benin and Oyo empires and other earlier Nigerian empires and civilizations. He promises to hit the ground running while highlighting the importanc of tackling Boko Haram insurgency, Niger Delta militancy, power shortages and unemployment. 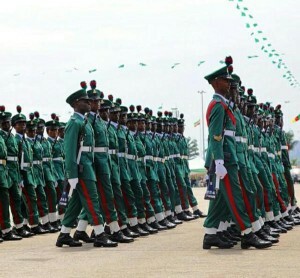 He has announced to move the command headquarters of the Nigerian Military to Maiduguri temporarily. 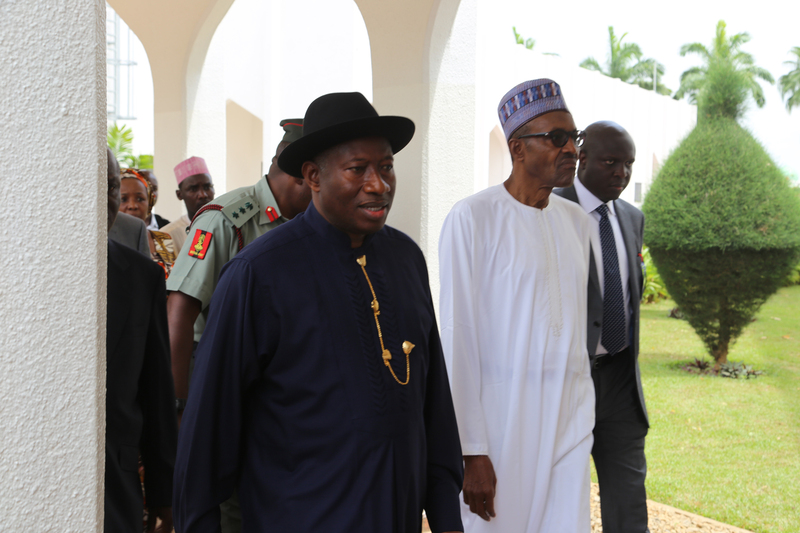 He characterizes Boko Haram as anti-Islam and promises to do all his government can to rescue the Chibok Girls alive. He says the amnesty programme in the Niger Delta that is due to end in December will be made more effective but streamlined. He asks stakeholders for cooperation. He says his government will tackle youth unemployment through the encouragement of agricultural entrepreneurship, solid mineral mining, and provision of credit facilities to SMEs. 12:10pm: Another parade by the military. 12:40pm: K-1 the Ultimate is back on the bandstand. His status has been elevated, hasn’t it? 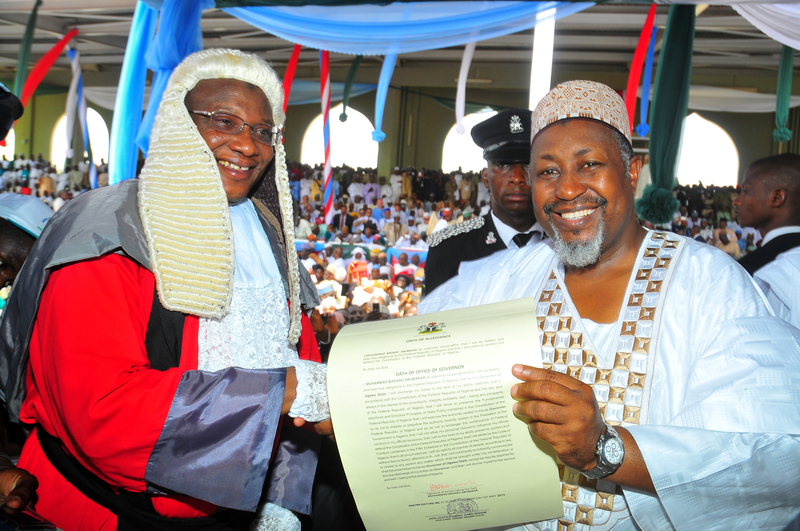 It is not everyday a singer gets to claim the centre stage at presidential inauguration. 12:50pm: President Buhari is moving round attending to high-caliber officials and guests from around the world. The vice president and his wife have already left. I understand there will be a national prayer session at the National Mosque and a presidential luncheon to come later. 12:54pm: President Buhari is in photo session with the APC chieftains including Senator Bola Tinubu and Gov Rauf Aregbesola of Osun State. Of course, the official proceedings have ended at the Eagle Square, the crowd shows no sign of reducing. 12:57pm: President Buhari is about to leave the Eagle Square. But there are still people he has to greet on the way to his waiting car. 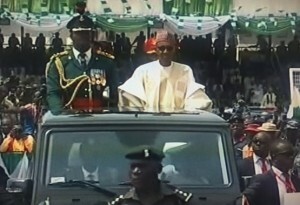 And the man of the moment finally enters the car and leaves the Eagle Square. 15:15pm: The vice president of Nigeria Prof Yemi Osinbajo was decorated with the national honour of Grand Commander of Order of the Niger by former president Goodluck Jonathan. 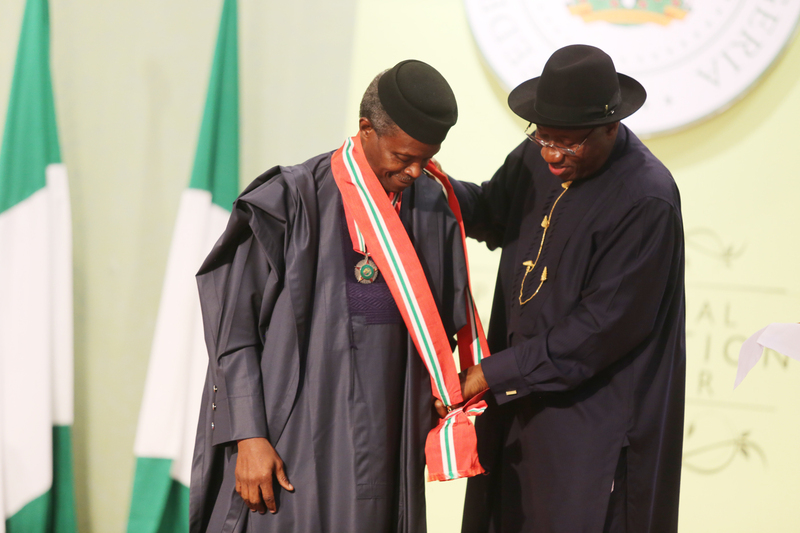 The decoration took place yesterday during the pre-inaugural dinner at the State House, Abuja. The Guardian’s Philip Ojisua came back with these pictures. 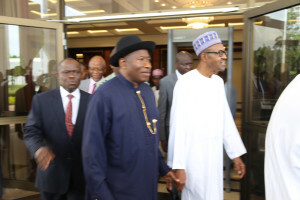 President JONATHAN,God bless you for your magnanimity.You make Nigeria proud,am particularly greatful to you. SAY WHAT OR YOU MEAN TO SAY THAT YOU HAVE DONE YOUR VERY WORST. GOODLUCK JONATHAN YOU AND THE VERY FEW BUT VERY SHAMELESS PRAISE SINGERS AND CHARLATAN AROUND YOU, NEVER KNEW THAT THIS DAY WILL COME. JONATHAN YOU HAD YOUR OPPORTUNITY BUT YOU VERY DISGRACEFULLY BLEW IT AND BY DOING SO YOU HAVE MADE IT NOW ALMOST IMPOSSIBLE FOR ANY PERSON FROM THE MINORITY TO EVER LEAD NIGERIA. HISTORY AND POSTERITY WILL NEVER EVER FORGIVE YOU. YOU HAVE NOW JOINED THE SCRAP HEAP OF VERY FAILED PRESIDENT AS A VERY LONELY, VERY ISOLATED AND A VERY DEJECTED [PERSON. THIS IS JUST THE BEGINNING OF YOUR WOES AS THE CRISES WILL CONTINUE TO MOUNT WHEN YOU ARE CALLED UPON TO ACCOUNT FOR YOUR MISDEEDS, VERY OBSCENE MALADMINISTRATION AND VERY UNIMAGINABLE OFFICIAL CORRUPTION. WE THE PEOPLE NOW HAVE THE VERY LAST LAUGH AND IT IS A VERY SWEET AND A VERY LOUD LAUGH. NOW WE HAVE PRESIDENT BUHARI A VERY FIT, A VERY PROPER PERSON, A VERY WILLING, A VERY READY, AVERY ABLE AND ABOVE ALL AN ALMIGHTY GOD FEARING FEARING PRESIDENT. A VERY RIGHT MOVE IN THE VERY RIGHT DIRECTION, A VERY GOOD BEGINNING. NOW WE HAVE A GOVERNMENT IN PLACE, THAT IS PUTTING ITS MONEY WHERE ITS MOUTH IT. 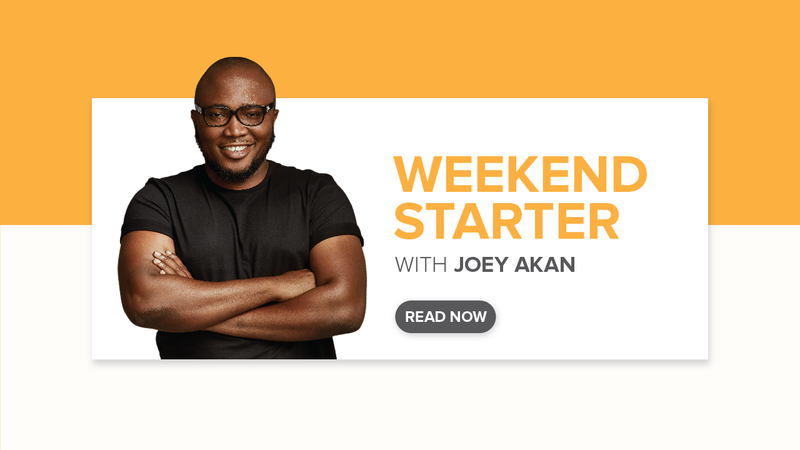 WE DO NO LONGER HAVE A GOVERNMENT OF PROCRASTINATION, A DO NOTHING BUT STEAL AND LOOT ALL OUR MONEY AND WEALTH, THAT CHARACTERISED THE FORMER GOVERNMENT OF GOODLUCK JONATHAN. I thank God to be able to witness this day of answered prayers. Congratulations to President Buhari and VP Osinbajo. Congratulations to those who worked hard to bring about the change today. 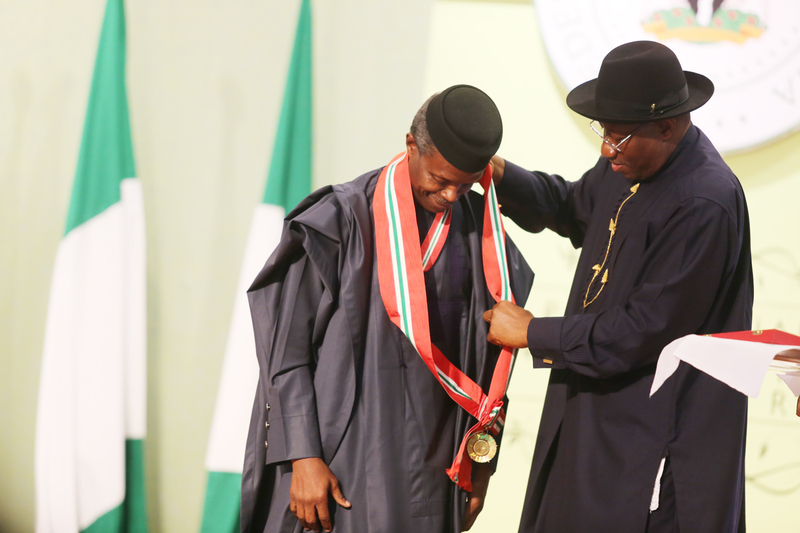 Congratulations to ex-President Jonathan for his choice to put God & country first at his most vulnerable moment. Congratulations to ALL Nigerians. 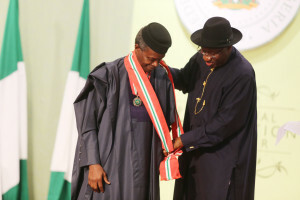 May God Bless our new President, his VP and all Nigerians. For the new administration that have just begun, May God make us truly thankful.